Ocean lovers from all over New England are invited to come celebrate World Oceans Day at the Aquarium this Sunday, June 5 with free family activities on the Aquarium's Harborwalk. The event will take place from 11 a.m. to 4 p.m. Not only will there be sustainable seafood tastings, kayak demonstrations and ROV submarines ... there will also be giveaways and chances to win these amazing prizes! 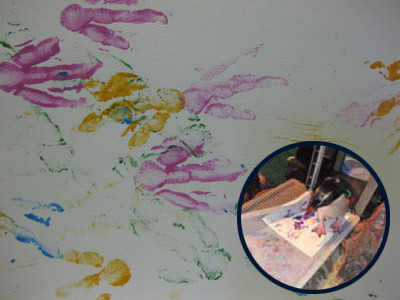 How would you like to hang up a work of art created entirely by the webbed feet of the Aquarium's penguins? This rare prize will be handed out to a lucky visitor who gets their penguin bookmark punched at each table station at the Aquarium's World Oceans Day event. By entering the drawing, you'll experience all the great activities and you'll have a chance to decorate your home with the penguins' fancy footwork. 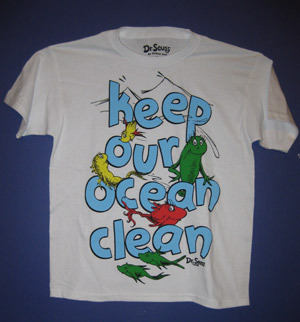 If you're a fan of the oceans and Dr. Seuss, this is the perfect prize for you. Runners up in the drawing of completed penguin bookmarks will get these T-shirts featuring Dr. Seuss's iconic fish characters. 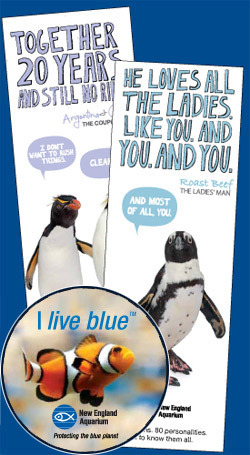 Everyone who comes to celebrate World Oceans Day will receive a penguin bookmark showcasing an Aquarium penguin's unique personality. You'll also receive a live blue™ button to help spread the word that we can all make every day choices to protect the blue planet. These giveaways are available while supplies last, so make sure you arrive close to when the event starts at 11 a.m.
Share your thoughts about World Oceans Day on facebook and twitter this Friday, June 3, at noon for a chance to win tickets to the Aquarium and Simons IMAX Theatre. Get the details here. Learn more about the Aquarium's World Oceans Day event here. We'll see you on Sunday!